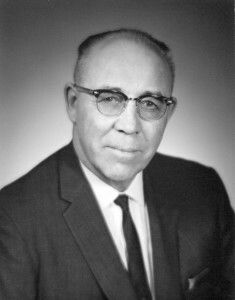 Our Grandfather, Selmer G. Swenson, sold his farming equipment and moved from Iowa to Sioux Falls, SD just after World War II. 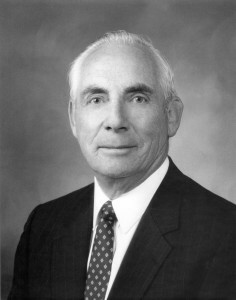 He founded this company in 1946 with his son, Mark, and son-in-law, Chuck Connor, to provide household plumbing and bathroom products to baby-booming families. 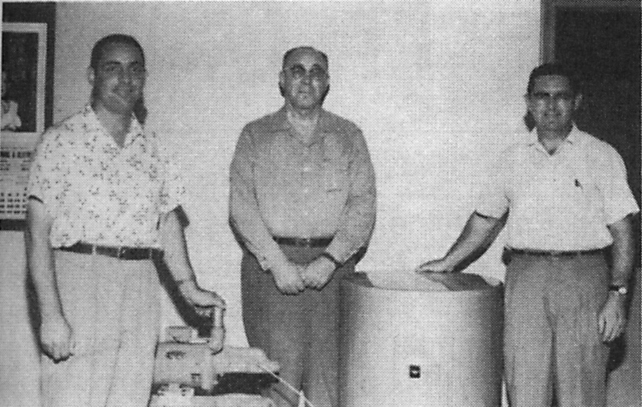 Selmer sold whole house plumbing systems…from the well to the indoor bath…on just a handshake. Swenson Plumbing and Heating on Weber Ave. in Sioux Falls, SD. 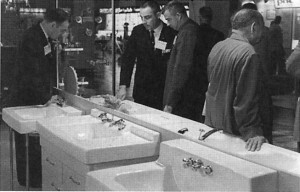 Mark Swenson at a Trade Show in 1946. The Sioux Falls operation relocated to a new and larger building that houses its present headquarters in 1959. A modern showroom and retail facility were maintained with a warehouse for the retail and contracting operations. 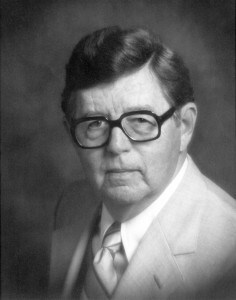 In 1969, Selmer Swenson passed away leaving the company with the vision of a larger retail showroom. Though Swenson Plumbing and Heating was still flourishing, in 1971 Selmer’s dream came true when a larger Handy Man showroom opened in Sioux Falls. 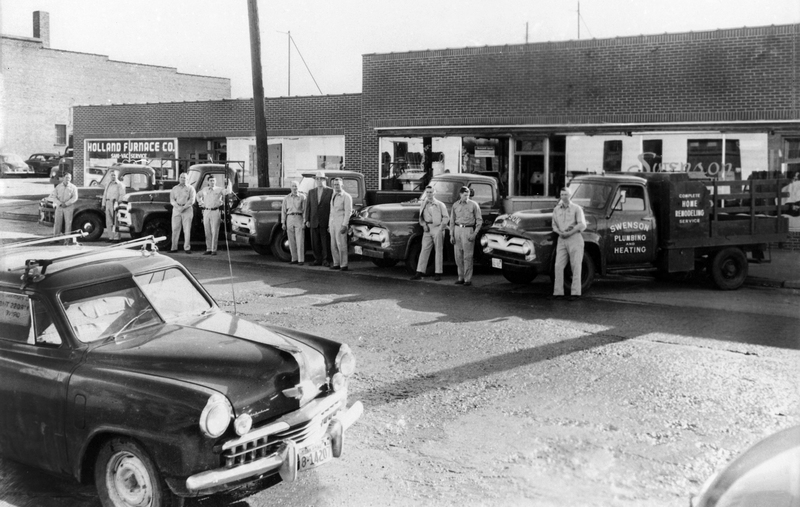 Sioux City, Iowa became home to the second Handy Man, but was renamed to PHE (Plumbing, Heating & Electrical) because there was another business operating under the name of Handy Man in the state of Iowa. A third store opened in Lincoln, Nebraska July 1975. Again, it was named PHE because there was already a business in the state of Nebraska operating under the name of Handy Man. The two PHE stores were renamed to Handy Man Home Remodeling Center in 1991. 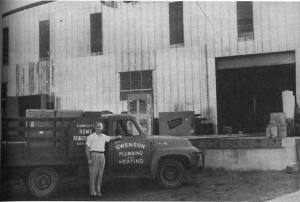 In 1984, Swenson Plumbing and Heating’s main concentration became the retail operations later called Handy Man Home Remodeling Center. In September 1994, Handy Man of Sioux Falls moved to 910 East 10th Street where the showroom exists today. The company is currently owned and operated by Mark Swenson’s sons, Joe Swenson, Ted Swenson, Steve Swenson and Matt Swenson. We are proud to carry on the integrity that our grandfather established in the company over 70 years ago. We hope that we will be serving your grandchildren 70 years from now. Our mission is to assist our customers in selecting the products that will best fit their individual needs in a prompt, courteous, and professional manner. We strive to stock only high quality, dependable products and offer them at competitive prices. Our educated team increases the value of service by providing helpful and beneficial information to ensure our customers are completely satisfied.